4 Bedroom Detached Bungalow For Sale in Cumnock for Offers Over £205,000. Stunning four bedroom detached chalet bungalow over three levels set in a quiet residential cul-de-sac with attractive views over the surrounding countryside and acc extending to the four bedrooms (master en-suite), generously proportioned lounge, kitchen, utility room, bathroom, dining room and conservatory. Further benefits include gardens to the front and rear, off street driveway parking and double garage. The front facing lounge has oak flooring, central fireplace, cabling for Sky+ television and double glazed windows to the side and front offering views over the attractive front garden and on to the surrounding countryside. The kitchen is situated to the rear of the property and has a range of wall and floor mounted units, stainless steel sink with drainer, recessed ceiling spot lights, integral electric oven and gas hob with cooker hood, double glazed windows and a double glazed door opening to the beautiful back garden. Access to the utility room is provided from the kitchen by way of a short stairway and leads in turn to the internal access for the double garages. This level of the property offers huge potential for conversion into a small 'granny flat'. To the side of the property and accessed from the lounge you will find the dining room with oak flooring, wall mounted central heating radiator and sliding glazed doors to the conservatory. The conservatory itself is double glazed, again has oak flooring and convenient patio doors opening to the back garden. On the upper level you will find the stylishly decorated bedrooms and bathroom. The master double bedroom benefits from built-in wardrobes, fitted carpeting, double glazed windows overlooking the back garden and an en-suite shower room with vanity unit wash hand basin, WC and walk-in shower cubicle. The property's second double bedroom has fitted carpeting, double glazed windows and a built-in wardrobe while the third double bedroom has fitted carpeting and double glazed windows to the front. The fourth bedroom also has fitted carpeting and a convenient fitted wardrobe. Externally there are well maintained gardens to the front and rear with the front garden being laid mainly to lawn with driveway off street parking to the side and the rear laid over split levels with secluded paved seating areas from which to enjoy the views, monoblocked and decked patio areas and a lawned area to the side. Due to it's location on Templand Drive this property benefits from extremely attractive views over the surrounding countryside and also offers spacious, adaptable family accommodation over three levels. Viewing is highly recommended to appreciate the accommodation on offer. 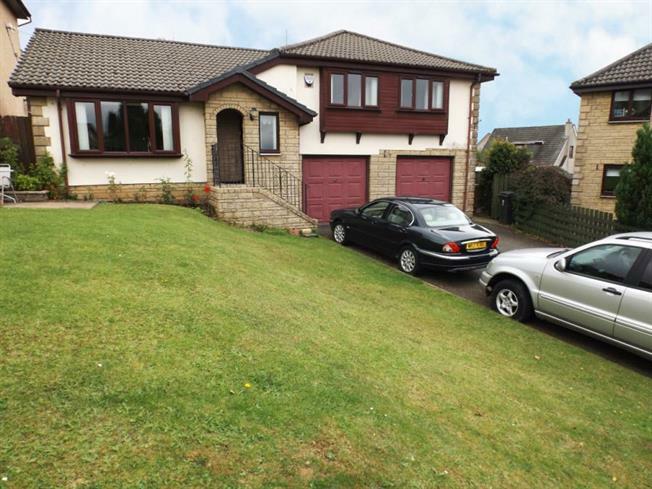 This property further benefits from gas central heating and double glazing.